A need for a good, modern,and carefully written book on Yogas in (Hindu) Astrology was long due, Dr.Charak has done the required work in brilliant way. The book has complete systematic method for analsyis and interpratation of various Yogas(Planetary Combination in Hindu Astrology). The book is based on Parashari system of Astrology. The book is well written and constructed. The much ignored Nabhasas Yogas are also investigated in the book. In order to make the art of Yogas interpratation very clear, Dr.Charak has very wisely used the famous Gaja Kesari Yoga, as an example to explain the whole approach to interpret and analysis the yogas. It would not be out of place to mention that after long long time,ever since late Prof.B.Suryanarayana Rao wrote a book on Yogas in early 1900's this is the only quality book, available in the market, written by a deeply serious writer who is also known for his clarity of expression and richness of material. A dispassionate reader will not be slow to recognise the fact that the book as written furnishes good food for reflective minds, especially because the book is written by Dr.KS Charak, in his own inimitable style. I heartily recommend the book to all lovers of Indian Astrology. 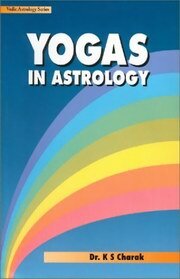 [This book] deals primarily with the technique of analysis & interpretation of the various astrological yogas according to the Parshari system. The approach to analysis is based on the standard astrological principles which are so often ignored when dealing with this all-important subject. The role of the houses where the various yogas form, the signs involved, the other planetary influences on the yoga-forming planets, the strength & weakness of the constituent planets, their status in the vargas, and the operating dasha have all been elucidated with examples. One full chapter has been devoted to the famous, but ill-understood, Gaja-Kesari yoga as a model example of the technique of yoga interpretation, and the various factors which facilitate or obstruct the functioning of a yoga. The Pancha-Mahapurusha yoga, the solar and the lunar yogas, and the important Dhana yogas, Raja yogas and Arishta yogas have all been treated exhaustively. The generally ignored Nabhasa yogas have been classified in a unique manner & their significance in horoscopic analysis emphasised. One chapter is devoted to the Sanyasa yoga. This book is profusely illustrated with examples.